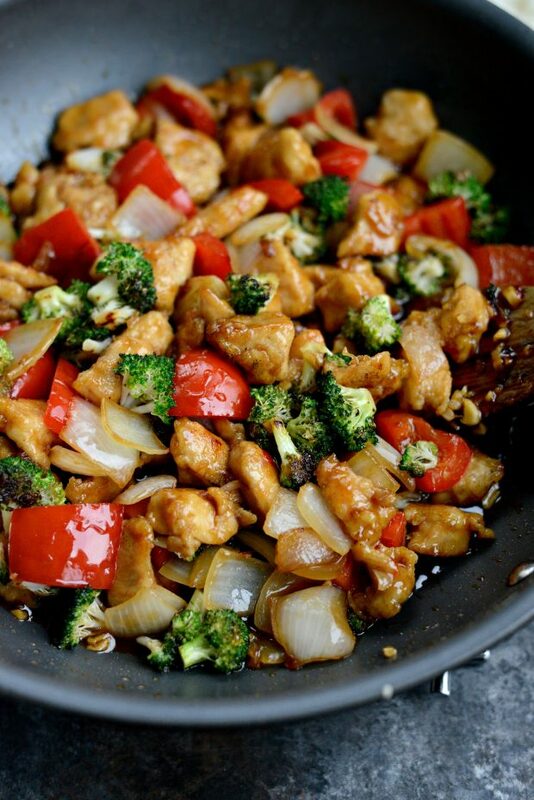 Skip take-out and make this healthy spicy ginger sesame chicken stir-fry at home! 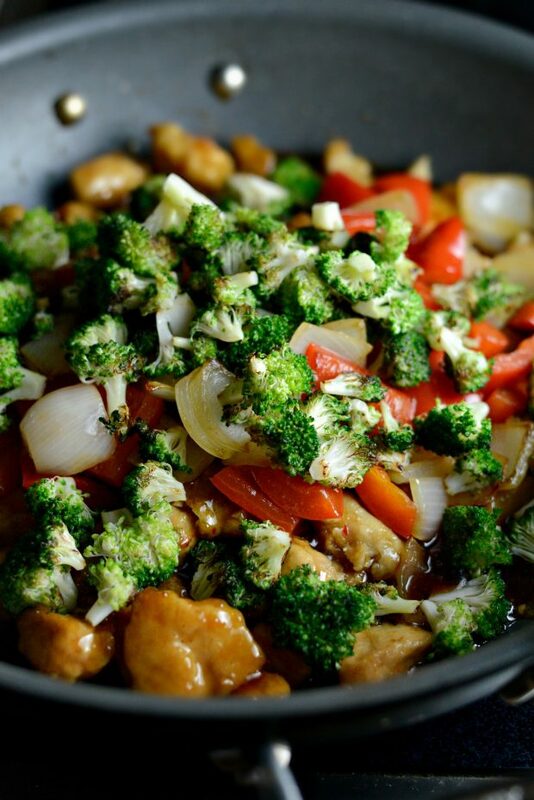 Loaded with vegetables like broccoli and peppers, tender pieces of chicken in flavorful and spicy ginger and sesame sauce. 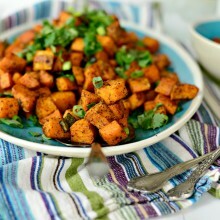 I serve it over Jasmine rice with cilantro and green onions scattered over top. Dishes like this one are my husbands absolute favorite. If he had his way we would have chicken, rice, broccoli and repeat. Which means I make dishes like this a lot. Trust me, I’m not complaining, I always feel good after I eat a light meal like this (extra broccoli for me please!!). After the holidays I have a hard time getting in the mood to cook anything. So I turn to and find comfort in stir-fry recipes. 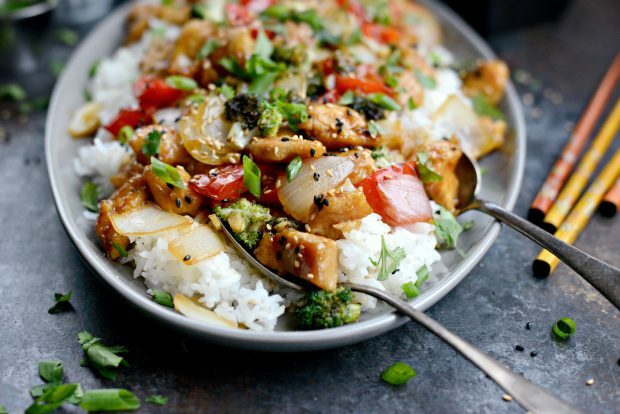 A stir-fry is a great way to eat lighter and better. Instead of deep frying the chicken, I cook it up in a wok with veggies and toss in a quick and easy ginger sesame sauce. 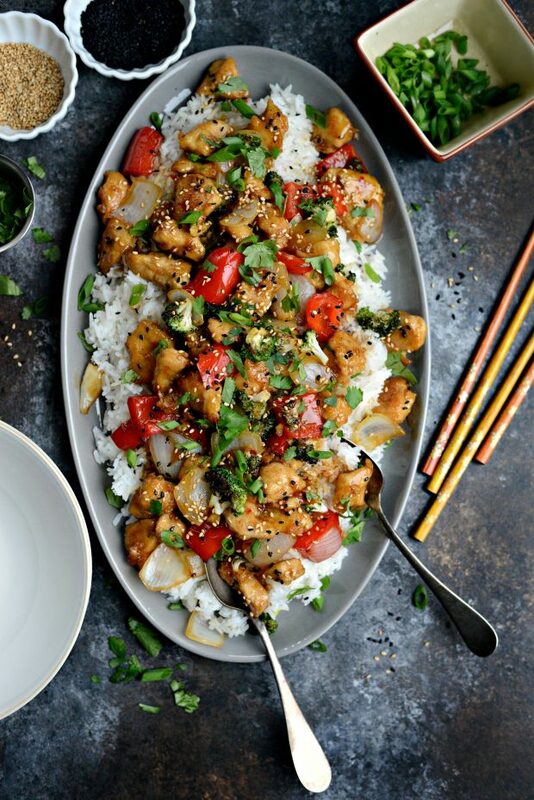 This spicy ginger version stems from this healthy sesame chicken recipe that I posted a few years ago. This time I swapped in some spicy chili paste and ginger to bump up the flavor and give it some kick! Once you prep everything, this recipe does move pretty quickly. So it’s a good idea to dice, chop, measure and mix everything before you begin. First, separate two egg whites from their yolks and whisk until frothy. 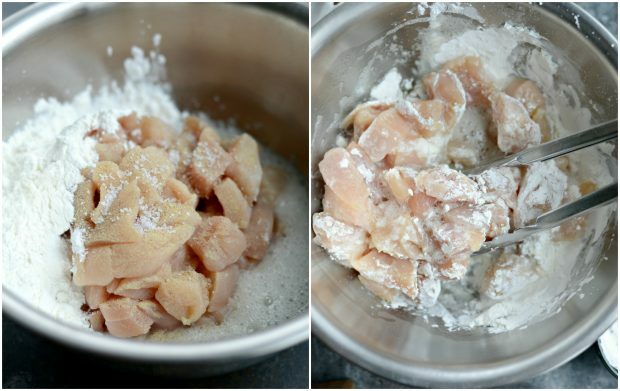 Then toss in the diced chicken, 1/4 teaspoon white pepper [affiliate], a pinch of salt and 1/4 cup of cornstarch. Toss to combine and set off to the side. 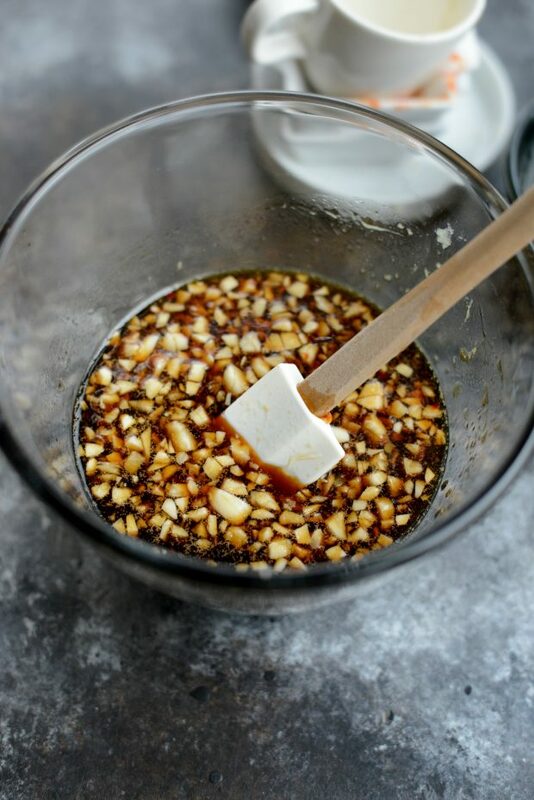 Then make the stir-fry sauce: 1/2 cup honey, 1/3 cup low-sodium tamari (or low-sodium soy sauce if preferred), 1 heaping tablespoon minced garlic (about 4), 1 heaping tablespoon grated ginger, 1 teaspoon up to 1 tablespoon chili paste (like sambal oelek), 1 teaspoon or more to taste of toasted sesame oil. Stir until the honey is dissolved and set aside. 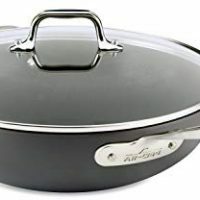 Heat a wok or large frying pan on high heat. Add a tablespoon of oil and once hot add in the broccoli. Stir to coat in the oil, and cook until browned and caramelized, about 5 minutes. Transfer to a clean platter. Then add another teaspoon to tablespoon of oil to the pan along with the peppers and onions. Toss to coat, season with a pinch of kosher salt and cook until they are tender but still quite firm. Transfer to the platter with the broccoli. Add half of the chicken to the wok (adding more oil if needed) in an even layer. Cook until golden and then flip and continue to cook. 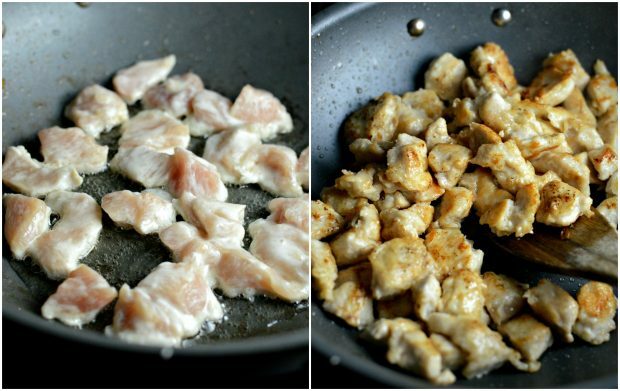 Transfer to a clean plate and cook the remaining chicken. 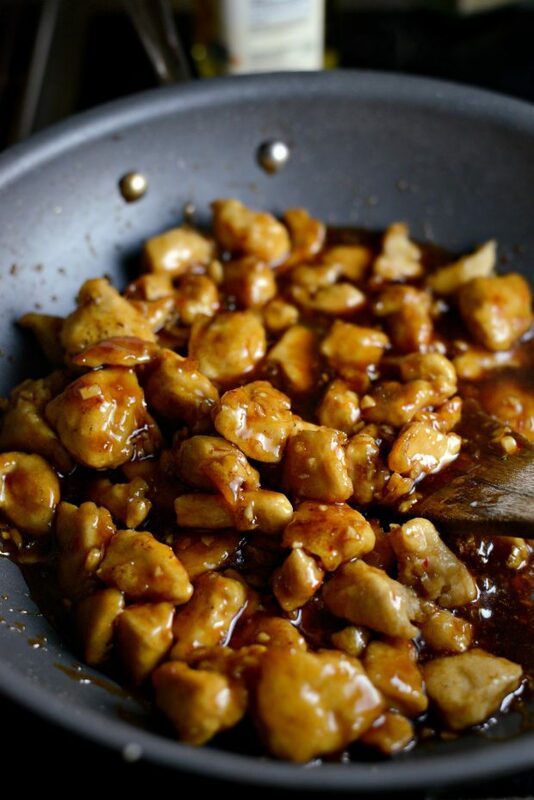 Add all the chicken to the wok and pour in the sauce. Once the sauce is boiling, pour in the cornstarch slurry (1 tablespoon cornstarch + 1 tablespoon cold water) and stir. Once the sauce is thick and glossy, add the vegetables back in. Lastly toss the chicken and vegetables together with 3 tablespoons of sesame seeds . 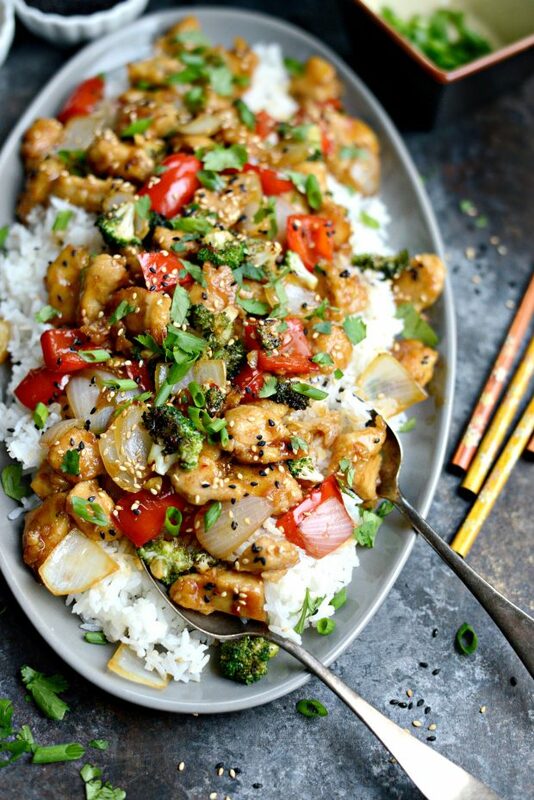 Serve this spicy ginger sesame chicken stir-fry over rice and sprinkle with more sesame seeds, some sliced green onions and chopped fresh cilantro. I really love the cilantro with the ginger and sesame. I even drizzle a little sriracha on mine! SO good. The whole dish is pretty fantastical. 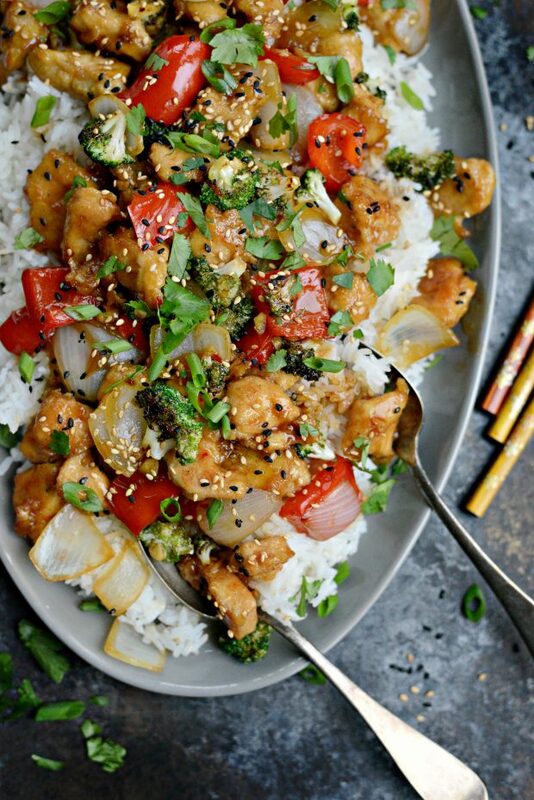 This ginger sesame chicken stir-fry smells amazing, tastes delicious and leftovers reheat beautifully and taste just as good! In a medium bowl, whisk egg whites until frothy. Add chicken, cornstarch, salt and white pepper and toss to coat. 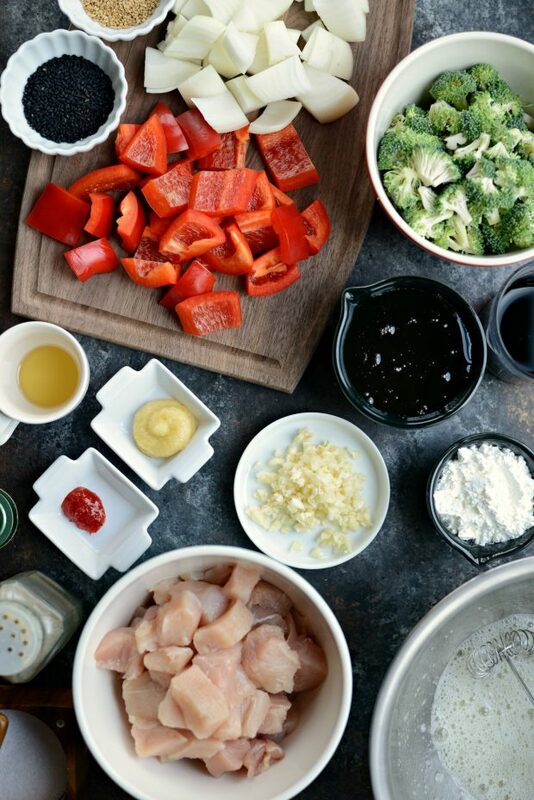 Heat a wok or large frying pan over high heat and add a tablespoon of oil. Once the oil is hot, add in the broccoli. Toss the broccoli to coat in the oil, then cook until caramelized, about 5 to 6 minutes. Transfer the broccoli to a clean platter. Add another teaspoon to tablespoon of oil to the wok. When it's hot, add in both the onions and red peppers and a pinch of kosher salt. Toss and cook until the edges are caramelized and the vegetables are softened but still firm. 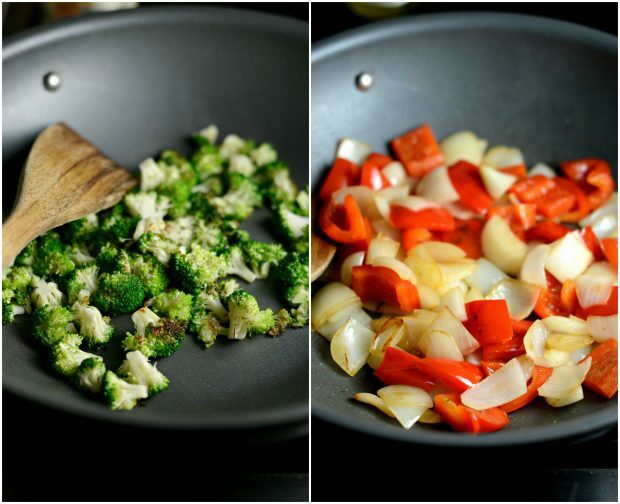 Transfer the bell peppers and onions to the platter with the broccoli. 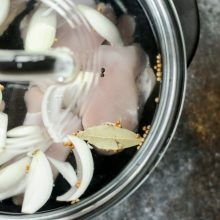 Reduce heat to medium-high and place have of the chicken into the hot wok (adding more oil if needed) and cook 6 to 7 minutes before turning and continuing to cook until chicken is no longer pink. Transfer to a clean plate and repeat with the second batch. Once the second batch of chicken is cooked, add the first batch back into the wok along with the sauce. Bring to a boil and pour in the cornstarch slurry. Reduce heat to medium and cook until the sauce thickens. Add vegetables back in with the sesame seeds. 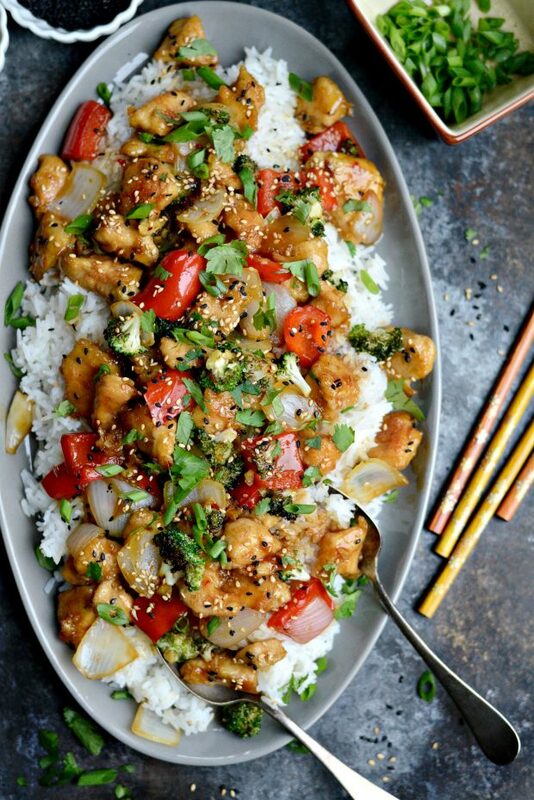 Serve ginger sesame chicken over cooked rice and sprinkle with sliced green onions, chopped cilantro and extra sesame seeds if desired. The recipes calls for 2 egg whites twice. 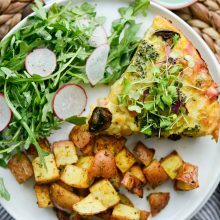 Is it correct to assume the recipe only uses 2 egg whites? Thank you. 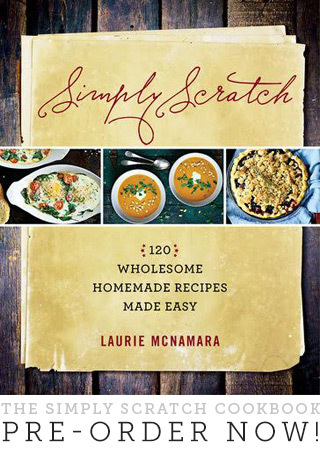 Love your recipes and cookbook. 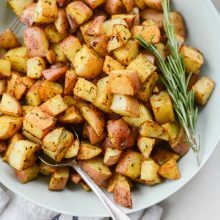 I wonder if this recipe would work if you preroast the vegetables instead of frying… Not to the point that they’re over roasted, but just a touch… Might be worth a try! Looks totally delish! The direction to add the cornstarch to the chicken is missing. The flavor in this stir-fry is amazing!!! The perfect amount of heat. A new favorite!! I love stir fry, if I could make it every single day, I probably would. Thanks for adding a new one to the rotation! 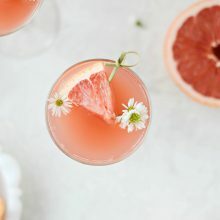 Another wonderful recipe. I’ve made many of your stir fry recipes, in fact, all of them! They never disappoint, are always tasty with just the right amount of heat. Perfection!!! 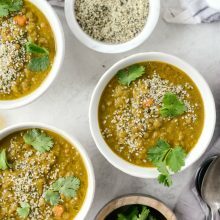 Hi, is there a substitute that could work instead of chili paste? I have everything but that. Thanks so much!! Hi Sharon! I would try a few dashes of Sriracha or a few pinches of dried red pepper flakes, it won’t be exact but should work. Enjoy!